Summer is the best season to bake any desserts with fruit. This past weekend, while shopping for groceries my local market had a huge abundance of red-brown pluots (a hybrid of a plum and an apricot) on sale that’s a shade overripe, so it’s on the softer side – and I bought several pounds of them. What fantastic about these pluots is it does taste so sweet and juicy that it drips down my wrists as I bite into them. Rather than taking the easy route and just eat them quickly within a day or two, I thought of baking cakes for my friend who is a relative fruit dessert fiend (that’s the loaf version) and family (the 8-inch round cake). I wanted some texture variation of the cake by having some almond flour (give it a richer, moist crumb) and the crunchy texture of the pistachio streusel (my favorite part for any streusel or crumb topped dessert). You may easily substitute these pluots for plums. Preheat oven to 350°F. and butter and flour a 9-inch round or square baking pan at least 2 inches deep. In a food processor pulse together streusel ingredients until combined and crumbly. The larger the crumbs, the better. In a bowl with an electric mixer beat butter with sugar until light and fluffy and add eggs, 1 at a time, beating well after each addition, and vanilla. Sift in flour with baking powder and salt and beat until just combined. Spread cake batter in pan, smoothing top, and arrange plum slices over it in slightly overlapping concentric circles. 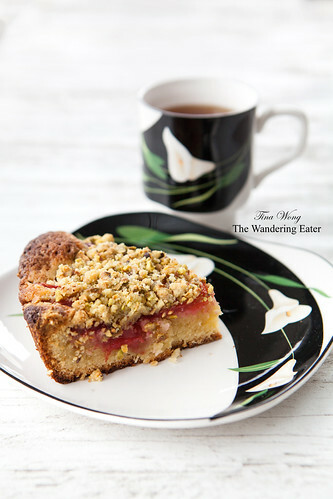 Sprinkle streusel over plum slices and bake cake in middle of oven about 50 minutes to 1 hour, or until a tester comes out clean. The cake may be made 1 week ahead: Cool cake completely in pan on a rack and freeze, wrapped well in plastic wrap and foil. Reheat cake, unwrapped but not thawed, in a preheated 350°F oven until heated through, 35 to 40 minutes. This cake looks incredible! 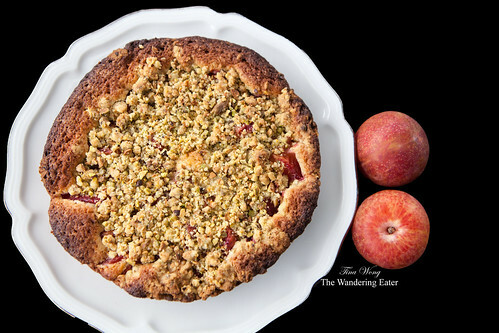 The crumble topping on a streusel treat is always my favorite part too, but pluots are wonderful and that pluot filling sounds heavenly. 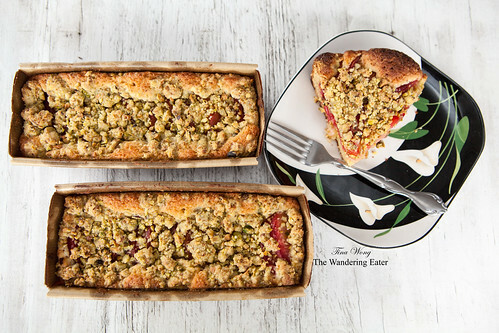 I’ve never made a pistachio streusel before, but it sounds good!